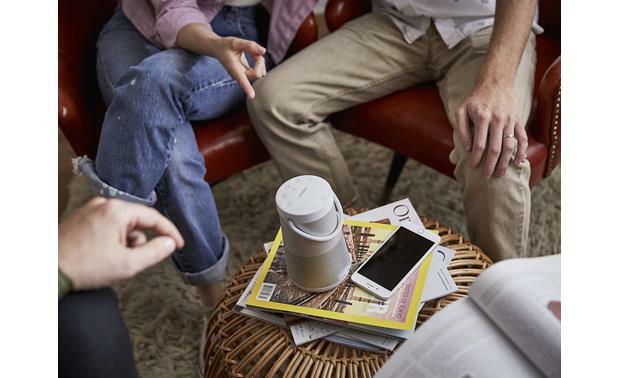 You might be surprised at how much sound the Bose® SoundLink® Revolve+ Bluetooth® speaker puts out. 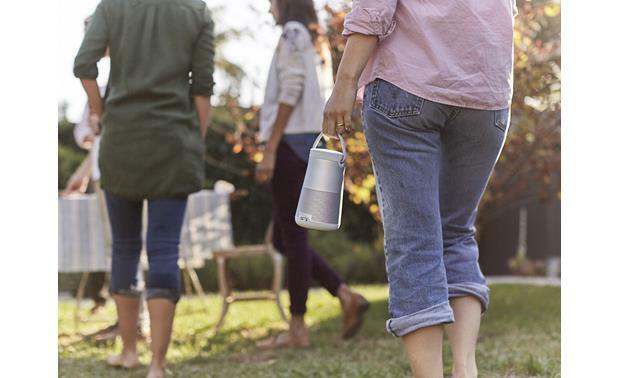 You might be surprised at how much sound the Bose® SoundLink® Revolve+ Bluetooth® speaker puts out. 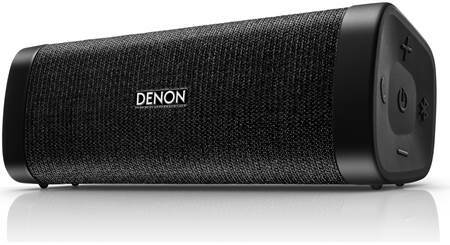 This compact, portable speaker delivers a big, immersive 360° soundfield. Its slender, water-resistant design features an easy-grab handle, so you can take it anywhere. The included charging cradle ensures the Bose® SoundLink® Revolve+ is always at the ready. 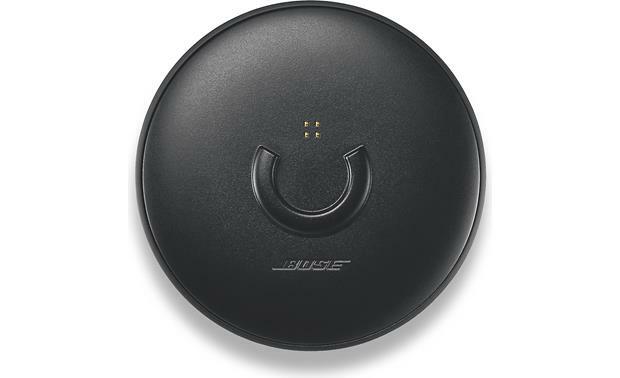 The free Bose® Connect app for iPhone®, iPad®, or Android™ smartphone or tablet gives you intuitive remote control. 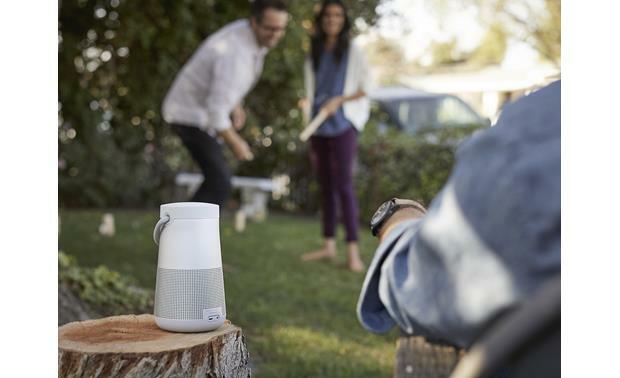 The Connect app also lets you pair two SoundLink® Revolve speakers. Have them play two-channel stereo, or the same signal simultaneously for double the volume. And you can pair two devices to your SoundLink® Revolve+ at the same time. So you and a friend can take turns playing tunes through the speaker and keep the music flowing. Voice prompts talk you through the Bluetooth pairing process. Thanks to built-in NFC (Near Field Communication), you can pair a compatible device just by touching it to the SoundLink® Revolve+. The speaker also has top-mounted indented control buttons. So you can control it without touching your smartphone. Just place your speaker on the recharging plate. The raised guide makes it easy to slip the speaker directly onto the plug. You can also use the included USB recharging cable to recharge directly from your computer. The built-in rechargeable battery delivers up to 16 hours on a full charge. 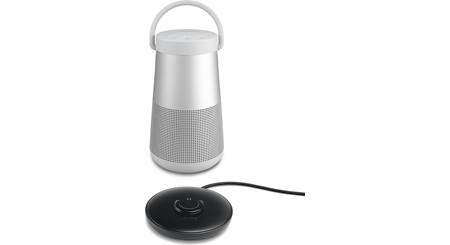 The Bose Soundlink Revolve + bundle consists of the Soundlink Revolve portable Bluetooth speaker with the Soundlink Revolve + Charging Cradle (both individually packaged). 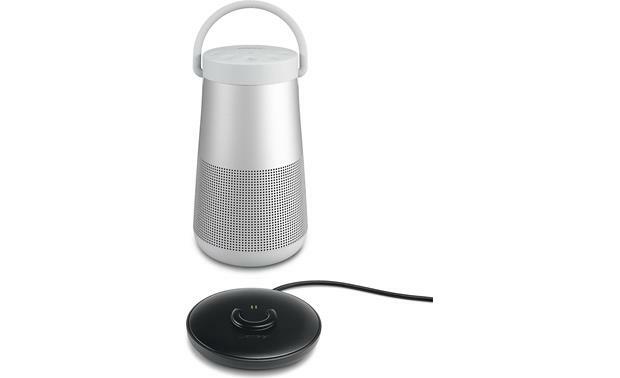 Bundle Overview: The Bose SoundLink Revolve + bundle consists of the portable Bluetooth speaker and the charging cradle to keep it charged and ready. The charging cradle is a convenient home base for your speaker, and allows you to play your music while it charges. The cradle uses the wall charger and Micro USB cable that is supplied with the speaker. 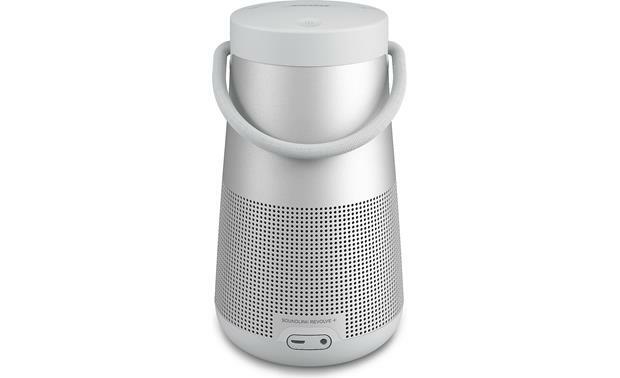 360° Full-Range Sound: The Bose SoundLink Revolve+ utilizes a highly efficient transducer for full-range sound, dual-passive radiators for deep lows with no unwanted vibrations, a pressure trap to eliminate any imperfect noise to keep the sound smooth, and an acoustic deflector for an omni-directional experience. All this adds up to true 360° sound for consistent, uniform coverage. Water and Bump Resistant: SoundLink Revolve+'s water-resistant design means you can use it more places without worrying; like at the pool, in the bathroom, or by the kitchen sink. With extensive testing and an IPX4 rating, Bose has ensured the speaker will long outlast an accidental showering of water. Thanks to its soft-material exterior, you don't even need to worry about knocking it over, tossing it in your bag, or sitting it down a little harder than you meant to. Note: The SoundLink Revolve+ is water-resistant, but not waterproof. The speaker should not be submerged in water. 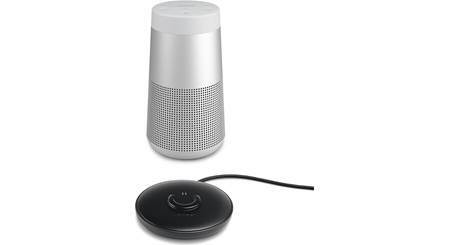 Voice Guided Multi-Device Pairing: Voice prompts talk you through Bluetooth pairing, making it simple to wirelessly connect your Bluetooth-enabled source device to the Bose SoundLink Revolve+. The SoundLink Revolve+ keeps track of the last eight devices to have paired with it, dropping the least recently used when a new one is paired. 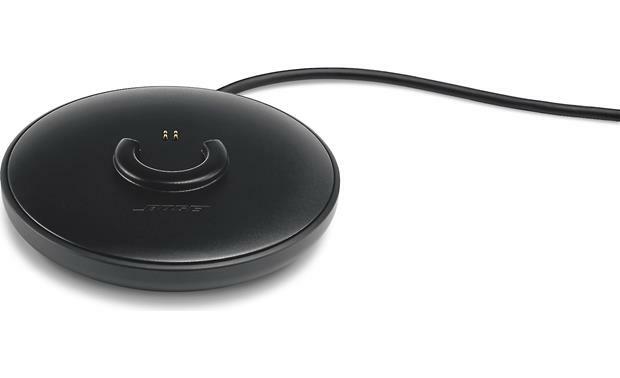 It even allows you to keep two Bluetooth source devices connected at once for easier switching between devices (however, it will only receive audio from one device at a time). 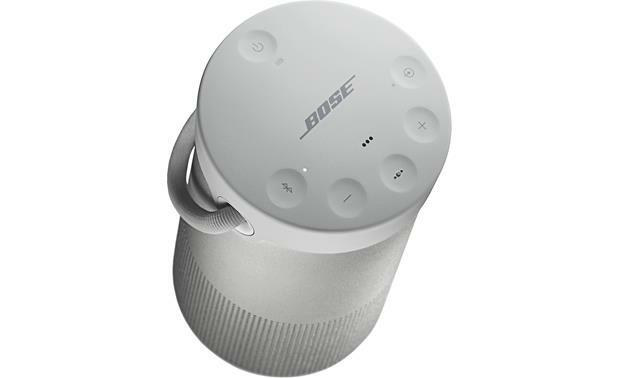 The Bose SoundLink Revolve+ will automatically re-connect with an already paired Bluetooth source device when it is in wireless range (up to 30'). Your Bluetooth-enabled devices can be paired either via SSP or NFC. 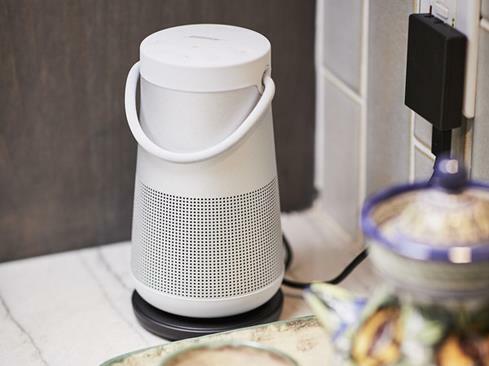 SSP (Simple Secure Pairing): With Secure Simple Pairing (SSP), the SoundLink Revolve+ will search for the nearest Bluetooth-enabled devices to pair with; without the need for complicated pin-codes. 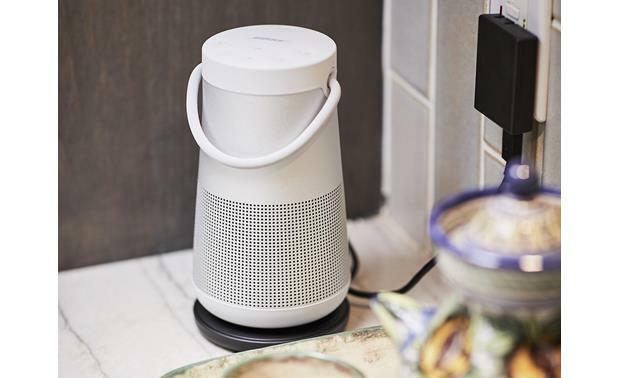 Wireless Music Streaming: Thanks to the support for Bluetooth A2DP and AVRCP, you can stream stored music and music apps from your Bluetooth source device to the Bose SoundLink Revolve+ speaker system. You also get basic playback controls like Play/Pause, Volume Up/Down, and Previous/Next Track from the SoundLink Revolve+'s top-panel buttons. 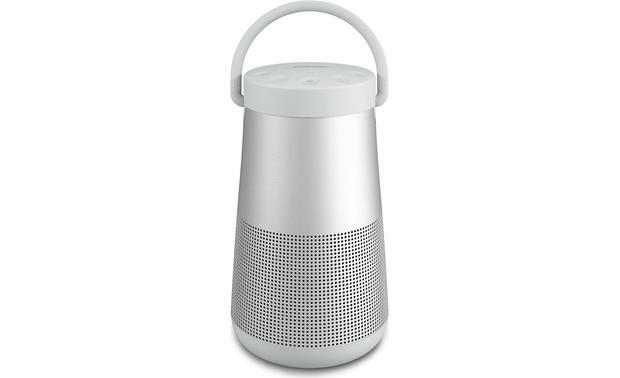 The Bose SoundLink Revolve+ has a range of approximately 30', so you can enjoy your music without wires. 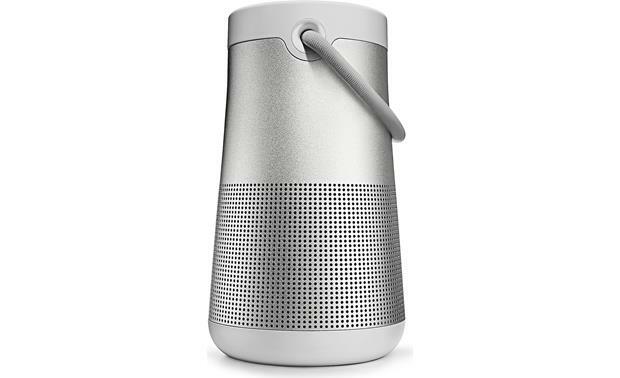 Hands-Free Speakerphone: The Bose SoundLink Revolve+ also features a built-in mic, so you can use the SoundLink Revolve+ as a speakerphone for your smartphone. The built-in mic will be used to carry on your side of the conversation, while the other party is heard through the Revolve+'s speaker. 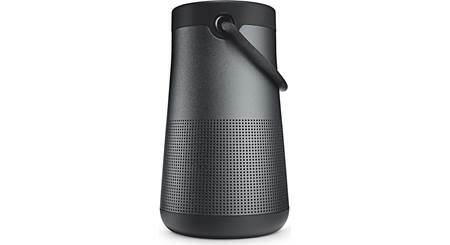 You can use the SoundLink Revolve+'s top-panel controls to answer, end, and reject calls. The SoundLink Revolve+ can even access the voice dialing functions of your smartphone and audibly identify incoming callers (when applicable). Digital Voice Assistance: The SoundLink Revolve+'s built-in mic can even act as an extension of the microphone on your Apple iPhone 4S-up or compatible Android smartphone, so you can access Siri and Android's digital voice assistant (like Google Now). Stereo and Party Modes: For those times when one Bose SoundLink Revolve+ isn't enough, you can use the Bose Connect app to pair two SoundLink Revolve+ speakers together. 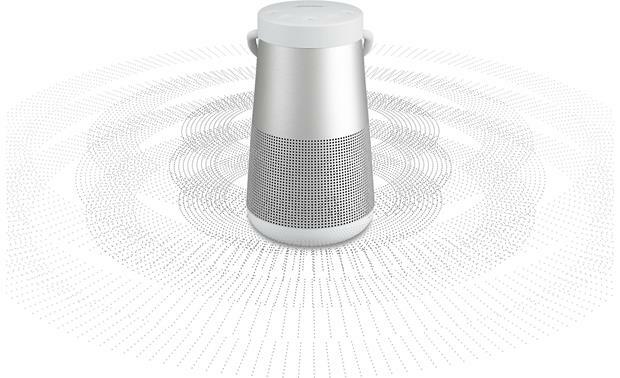 You can select Party mode to pair two Revolve+ speakers together for double the sound. You can select Stereo Mode to naturally separate and spread the sound across an immersive stereo soundstage. Top-Panel Controls: Top-panel controls include Power, Pairing, Input, Volume, and Multi-function. The Multi-function button provides Bluetooth music playback functions (such as Play/Pause and Previous/Next Track), as well as Bluetooth hands-free phone functions (such as Voice Control/Digital Assistant Activation, Answer/End/Reject/Mute Call, and Device/Speaker/Call Switch). Rechargeable Battery: The rechargeable lithium-ion battery gives you up to 16 hours of playback time. Using the SoundLink Revolve+'s microUSB input, the included microUSB-to-USB cable, and the supplied USB/AC power adapter you can charge the built-in battery. It takes approximately 4 hours to fully charge the built-in battery. Carry Handle: A flexible fabric handle makes the SoundLink Revolve+ speaker easy to move and carry from room to room. 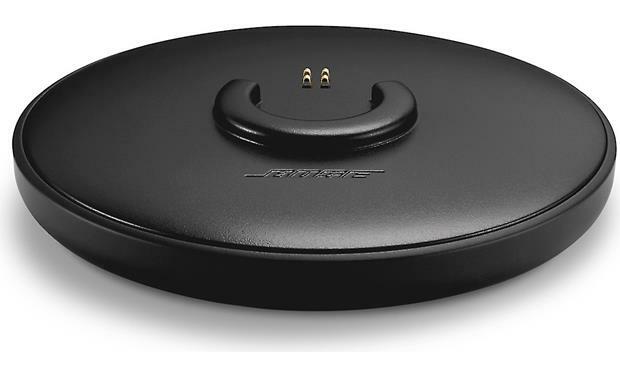 Searches related to the Bose® SoundLink® Revolve+ Bluetooth® speaker and charging cradle .